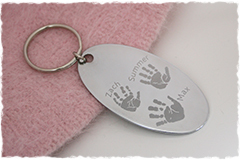 After taking a perfect impression of your child’s or loved one's hand, foot or fingerprints, we create timeless, stunning handcrafted gifts in pure polished silver in our Berkshire Studio. From bracelets, necklaces and individual charms to cufflinks, bookmarks and key rings, there's a perfect gift for everyone. 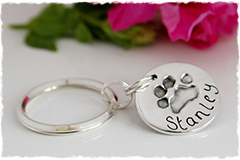 We can even capture paw prints to immortalise your much-loved moggy or precious pooch. 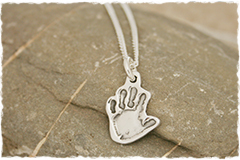 Fingerprint Jewellery is the perfect gift for any occasion. Time has a way of slipping through our fingers, doesn't it? 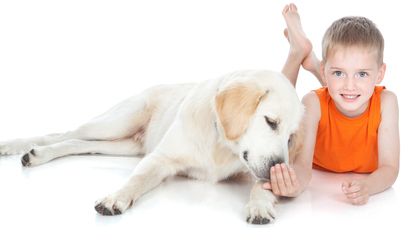 Imagine being able to hold your baby's foot or hand in the palm of your own years from now. As you trace every line and crease, every perfect detail, you'll marvel at how small they were and be instantly transported back to this precious time in your life. Or imagine instead touching the fingerprint of a beloved grandparent and remembering how those time-worn hands gently tended your grazed knees or taught you how to cook when you were a child. 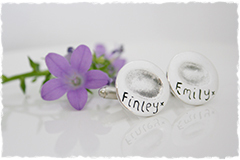 We may not be able to pause time but The Dinky Fingerprint Company can help you capture special moments to create memories you can touch forever with our vast range of handcrafted silver fingerprint jewellery.